What people are saying about Midwest Skijorers training clinics. 1. Wow, What a difference this approach makes! 2. My dog and I both thank you tons. 3. After using the information my dog actually gets it now. 4. Great breakdown and explanations. more importantly it works great. progression is the objective and priority of your classes. for him. Thank You, Thank You, Thank You. 9. Thanks for the reality check, you do get out what you put in. basics is exactly what he and I both needed to do. My dog was chase dependent and now he confidently pulls and has fun and we can go anywhere anytime. 12. It is apparent that you know dogs and you truly enjoy training. each dog and person as needed, it makes sense. goals. I think she will do a 1 minute line-out already. I can continue to train at home. empowered my dog to think and succeed. charging. Free for members! Well duh, I joined immediately. and saw it all work wonders on my dog, I am so in ! just jumped in and said hike, like it was nothing new. But you make the learning curve fun. questions I haven't asked you yet. 25. Great clinics. Also awesome information in the websites' "members forum" (we joined at the first clinic we attended). 26. Awesome training trail, it's made for successful learning. Great for practicing too. 27. Gee, Haw, On-by, and Passing training made easy (and fun). NICE ! 28. The groundwork on foot makes an amazing difference. 29. You provide a great service to the sports participants (canine and human). 30. Definitely something for everyone of all levels. 31. You removed the intimidation of starting this new endeavor. 32. Love the small class size. Love the tips on situation awareness. 33. Everything I wanted to know that Thor left out. 34. We use to have a a swinging towline a lot or most of the time. We were basically doing the SkiWYD (Ski With Your Dog), aka loose leash skiing with some pricey equipment. Now we have the snug tug and are having way more fun. Do you Want to Host a Clinic in Your Area ? There is a huge need for high quality dogpowered sports training in all geographical areas. While we are based in the Midwest (Minneapolis/StPaul metro area), we can bring quality training to you. If you live in an area that needs a service like Midwest Skijorers’ Dogpowered sports training and you would be interested in hosting our team, please let us know! Midwest Skijorers is always looking for new areas that need us so that pets in need can be successful, healthier and happier. A location with a parking lot that has enough space for a vehicle that is 35 feet x 10 feet, as well as 6-20 parking spaces for clients and staff to park. A location that is easy to find for local residents. Restroom facilities that our staff and volunteers can utilize during our training day, typically between the hours of 7:30am and 4pm. Volunteers that can help to poster and spread the word about our service coming to make sure the clinic is full. A defined trail (less than 1 mile preferably with numerous loop choices). An open or semi-open area (2-3 acres) that can be utilized as a skills proficiency course setup. Provide course grooming/setup (turf trail, dirt trail, snow trail) Needs and specifications will be provided. Indoor space for our volunteers to clean and prepare. Indoor space for our volunteers (and participants) to warm up if needed. Indoor space for our staff and participants to meet and discuss training and do classroom presentations. Contact us for a quote on Cost per student/dog per session. and Travel/mileage fees. Accommodations and food for the staff and volunteers for a 2 day clinic – breakfast, lunch and dinner for 4 staff members and typically 1-2 volunteers, as well as somewhere to sleep and rest after clinic days. In this class we will take you from inexperienced to knowing the basics of training your dog for skijoring success. Meet up with other skijoring enthusiasts of your same skill level while training your dog for this winters skijoring fun! We provide all needed equipment for you to use for the day and we will have certified dog powered sports trainers on hand to guide you through everything you need to know to get started. Our proven pawsitive training methods give you real results while alleviating stress for your pet during the process. *** Registration is required. ** Class size is limited to better serve you and your dog. *** Classes fill fast, so register early. Racing 101: Are you interested in trying out a race? If so this is the class for you! Our Racing 101 covers everything that ALL race participants need to know about skijor and dryland racing, including RACE RULES, POLICIES, PROCEDURES, ETIQUETTE, PROTOCOL. Are you really ready ? Is your dog really ready? We also cover identifying, preventing, and managing race time stressors on you and your dog. Class is a power point/lecture with an extended Q & A. We offer pre-race timing events and offer free admittance to alumni of this course/seminar. Competitive DogPoweredSports; Step Up,Amp Up and, Ramp Up AKA Little Secrets, Big Secrets and Everything you want to know about CHAMPIONSHIP RACING. "If you wanna run with the big dogs, you gotta stop peeing like a puppy "
View Race Rules at the bottom of this page and the bottom of the events page. Our Training "Presentations" are informative classroom/discussion sessions without being a sales based infomercial. Our Training "Clinics" are dog-friendly and paws-on training sessions. "Dog friendly" means positive training,(also known as +R or positive reinforcement. We do not use aversive training techniques, we don't even use the word no (it is hard for many old schoolers to cross over from the old days of "yank and crank" but we all know that our dogs should not think their middle or last name is "No", or "dammit", or something worse. Back to our clinics, this is where the fun is. Sure it's training but we keep it fun for you and the dog (smiles and tail wags). Our clinics is where we show you how to shape behaviors. It is tough to put our clinic into black and white text or to a power point instruction. The power point presentation on here is designed to be viewed before our class so we can have less talk time and more training time for you and your dog. A wealth of information is covered in depth in the members only "forum" on here, which we call REX (Resources and Education for Excellence). "Cookie cutter or one size fits all training fails 90% of dogs." This quote is from Association of Professional Dog Trainers. Remember our "no dog left behind" training approach. "Our "clinics" are real-world and real-time training and is therefore individualized to what your dog needs. The black and white step 1, step 2, step 3, etc, changes as we assess that your dog is having trouble here, so we then adapt/adjust/improvise and overcome. And yes, at our training clinics we have demo gear that you can use so you can feel out the waters before dropping your hard earned cash on equipment. Our clinic class sizes are purposely limited to ensure a low student to instructor ratio, provide everyone and their dog with quality training, reduce canine stress and confusion, and to therefore maximize learning. Much like training a dog for obedience, agility, hunt test, field tests, flyball, search and rescue and other dog venues, we split the "whole skijoring thing" into small tasks that your dog can readily understand and practice and learn, then later we systematically and incrementally chain and sequence them together. By "breaking it down" rather than "lumping", we avoid the dogs' "sink or swim" type of stress often encountered with the "instruction by immersion" approach. There is a small charge for the clinics. Do we make money from clinics ? Not really, we may recover some of our costs (such as insurance which is quite expensive) but certainly do not make money. Do you get your moneys worth at our clinics? Yes, probably before the clinic introduction is over. Will your dog be fully trained a the end of one clinic ? No, but we will have given you tools and techniques to get started training your dog. We will also give you specific information on what to do for your dog until the next session you attend. (and you are welcome and highly encouraged to come back and practice, it's how we all get better). Our highly successful program is based on proven science and animal behavior just plain works. Could we charge more for our clinics? Sure, we could charge more. There are others that charge much more than we do while providing much less than we do. But this isn't about making sales or just taking your money. We are "paying it forward" and we want you to work with your dog and see your dog get it. When you see your dog click (hear, think, execute) and know that you trained that, now that's a "Priceless" feeling. We have a fantastic success rate and exemplary feedback from students. Can we bring our quality training class or clinics to your area or club? Sure we can and we have. In order to take our training to your area we will need to cover transportation and overhead costs and some of the logistics need to be handled by a local liaison, but we are more than willing to share our knowledge and resources to responsibly grow the sport. If you just cant make it to one of clinics, join the club and have access to the members only forum here online. We all start at different points and have different needs. We teach you to train your dog what YOUR dog needs to work on. No canned cookie-cutter one-size-fits-all approach here. We want you and your dog to be successful without stress and confusion. We use tools and techniques to promote systematic incremental learning while we avoid creating any dependencies. We train dogs for dog powered sports. Meaning we want them to pull on command and be in the Snug Tug Club. Our training is not set up for ski-wyd (Ski-With Your Dog, or skiing while the dog romps with a loose-line, ie not pulling); most anyone can ski-wyd without actually needing any skijor equipment or training. Our training is also not geared toward Ski-coursing (chasing something) which usually just results in a chase dependent dog, thereby leaving you always needing someone to follow. Do you have someone willing to commit to being your "fake lead dog" or "chase vehicle" also known as "rabbit training" for the next 10 years of you dogs life ? , (so much for independence, exploration, freedom, and adventure) And if you are the competitive sort; with chase and follow dependencies what is the best-case race placement ?...2nd place.... and worse case, if you have no one to follow, or they take a different spur trail, you might be out on the trail a long time waiting for a new "rabbit". This is not to say you can't have fun ski-wyding or ski-coursing, because you can, but our training is geared toward building responsible and successful skijoring, bikejoring, scooterjoring, canicross, and related pulling sports. TEAM=Together Everyone Achieves More: You can come to a class once, twice, or more,(free to members) but we all get better by successfully practicing what we have learned (consistency and repetition, LOTS of successful repetitions). Everyone is welcome and encouraged to come on out to practice line-outs, resistance training, gees, haws, on-bys, passing, etc. It is fun to train together and very rewarding to see the dogs progress and "blossom" into real "jor dogs". We are in the process of working on the beginner and intermediate certification tests. Our beginner classes are for the person who is curious about skijoring and/or is ready to take the first steps in learning to skijor. It is also for those wanting to progress beyond just skiing with your dog or those struggling with chase dependency. We can do the power point presentation followed by an informal Q&A session. But the real training is the hands-on/paws-on Skills Proficiency sessions. The classes may be followed up with personalized one-on-one training. In between the Basic classes and the Championship Competition we have a few other course options. Our Intermediate classes are for those who have learned the basics of skijoring and are looking to refine their skills and learn problem solving techniques. Skijor 202 begins with a power point presentation followed by a Q&A. We also offer a 202 clinic in which our qualified trainers will help you with your specific training issues, in a group setting and also one-on-one. Our advanced classes are for the well rounded skijorer looking to take their training program to the top level. Covered in this session are advanced training techniques, advanced canine nutrition, cutting edge equipment and advanced racing techniques. Skijor 303 is a powerpoint/lecture series with an extended Q & A period. Equipment, commands, etiquette, training tips, and techniques are covered in our power point presentation. Skijorers are responsible for knowing the events rules, policies, and procedures. Skijorers are responsible for safe contact-free passing (passing skills should be practiced extensively prior to entering a race). Teams must be able to complete the race course in a reasonable time (a maximum finish time may be in place). Each team will be assigned a start time and a chute time. Each skijor team shall be at the immediate start area prior to their CHUTE time (Race may specify this time). If start time is missed the clock start Time is generally the original start plus any penalty assessed. Skijorers should provide their own handler (generally 1 handler per dog). Handlers must promptly exit the start area to make room for the next team. Skijorers may use either skate or classic ski technique. Dogs must be treated humanely at all times. Dogs must be controlled and kept from other teams (before, during, and after event). Loose dogs are NOT PERMITTED at race site at ANY time (before, during, or after event). Skijorer should not disconnect towline from the harness except to clear a tangle. Skijorers are responsible for their dogs’ behavior (before, during, and after event). Aggressive (or overly reactive) dogs are prohibited from the event. Dogs may be handled by race staff during inspections, at the start area, or by trail help, so it is very important that your dog is well socialized (not fearful, anxious, or reactive). Skijorers (and handlers) are responsible for limiting stress (Always be your dogs’ advocate). Skijorers’ dog or dogs shall not interfere or impede another skijorers’ team at any time. If you or your dog are not proficient in passing or being passed, you should train pass proficiency before entering a race (passing is discussed in detail further below). Skijorer shall skijor (follow behind the dog on skis). Skijorers (or others) may not pace the dog by ANY means. All dogs must be sufficiently fit and conditioned to be able to complete the course. Dogs must be vaccinated for Rabies and any other vaccinations specified by the Race Giving Organization. Have a copy of the dog's rabies vaccination certificate available for submission. Purebred entries must provide registration papers to be eligible as a purebred. Sick dogs or those exposed to communicable disease are not permitted in the race. ALL dog injuries MUST be reported immediately to the Race Marshal and Veterinarian. Aggressive dogs MUST be reported immediately to the Race Marshal. All equipment must be in good working order. Nordic skate or classic skis are allowed. Towline shall include a shock absorber section. (No minimum or maximum amount of stretch in the shock absorber. Towline length, as measured from belt buckle to the 1st snap, shall be within specifications . (ISDRA= 7 feet to 12 feet’) (IFSS= 2.5 to 3.5 meters which is 8’2” to 11’6”). IFSS & ISDRA require a "means" of release within skijorers’ arm reach. It may be a mechanical release, a soft release, a belt hook, or other type of release. Harness shall be a design intended for dog powered sports (a pulling harness). Each dog shall wear a secure dog collar. (It shall be adjusted so that it cannot slip over the dogs head). Buckle collars or limited slip collars are suggested (avoid plastic buckle collars). Collars, muzzles or harnesses capable of choking the dog are prohibited. Dogs may be harnessed in single file or side by side or offset formation. A belly band may be used. Helmets are required for all youth skijorers. Helmets are allowed and recommended for adults. 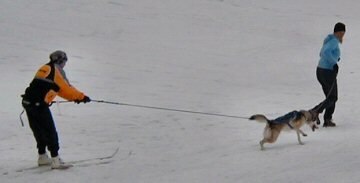 Neckline is required in 2 dog skijor teams unless run in single file. (in which case the rear dog is necklined to the towline). Park in the same parking spot each day, (for hygiene and canine health). Heat distances need not be identical, but the shortest trails shall be run first. Subsequent days’ heat distances shall not exceed 150% of the 1st days' length. Shortest and longest trail distances shall be possible distances for each heat shall be indicated on the invitation. CUMULATIVE TIME RACES: Dogs will be marked prior to the start of the 1st heat. The markings must be there on each subsequent day, (do not attempt to remove it). Only your dogs marked for a specific class may be used on any subsequent days’ class. All teams should arrive at the start area at least 1 minute prior to the assigned chute time. Skijorers should provide their own handlers, (1 per dog) in order to maintain adequate control and minimize stress (your dogs’) in the start and finish areas. Handler should be someone that your dog knows and likes and someone that knows dogs. Handler should be advised to clear the immediate start and finish areas as soon as possible. At some races start help/chute help will hold the skijorer at the waist. The front tips of the skijorer’s skis must be behind the start line prior to the signal to start. The skijorer’s race bib must be visible to race officials. Single panel bibs shall be worn in front and above the waist. A passing skijorer must execute a pass only when conditions are safe. Both skijorers may say “on-by” but that is a very small part of passing. On-by is merely a word. The actions of both passing parties are paramount to successful passing. In the event of a protest for failure to facilitate a pass, the actions, or lack of actions, may determine the course of penal action. The skijorer being passed should be prepared to slow down (stop skating) and move inline behind their dog and move to the non-pass side of the trail. The skijorer being passed should stop poling and hold their poles behind, low, parallel to the trail, and away from the passing team. The skijorer being passed should be prepared to reel in line and hold the dogs’ harness to prevent any contact or interference with a passing team. The passing skijorer should move to the off-pass side and should pole on the off-pass side and exercise extreme caution when poling in close proximity to all teams being passed. NOTE: You will both lose far less time and create much less stress, by concentrating on and ensuring successful passes, than you will with any tangles or leap frog sessions. Repass rule does not apply in “No Right of Way” or “No Mans Land” zones. Skijorers must maintain a minimum distance of 20 feet between his/her dog(s) and the skijorer in front. (No tailgating). Skijorers must always exhibit care, good judgment, good sportsmanship, and fairness whenever passing occurs. Failure to control your dog (before, during, and after the event) is grounds for a protest and consequences up to and including disqualification. All skijorers shall cooperate with others in order to have successful contact-free and interference-free passing. Keep the finish area and exit corridor free of congestion. (Do not stop and socialize at the finish line) Proceed to your car to care for your dog. (Your dog will experience much less stress at the car than at the finish area). Only race officials and race authorized persons should be in the immediate finish area. Spectators will be near the finish are and should be managed by crowd control measures. Personal dog handlers are welcome at the finish area but must stay clear of all finishing team traffic. Handlers should be position so as not to distract or interfere with other teams finishing. Skijorers and their dogs shall exit the finish area promptly. The handlers should assist in promptly clearing all teams out of the finish area (includes completely clearing the exit corridor). Skijorers and their handlers are encouraged to help others get to and from start and finish areas. Water or feeding of dogs shall only be done at skijorers’ respective vehicles or RGO approved and designated areas (this is both interference and an anti-doping issue). Dogs shall not be brought back to the start or finish areas at any time. Any protests shall be presented verbally to the Race Marshal immediately after the heat of the incident or infraction. Any protests shall be followed up with a written report (preferably using Race Protest /Incident Report Form) to the Race Marshal with in 1 hour after the heat of the incident or infraction. Protest form is available online, and should be available at race site (from the race marshal) If no protest form is available submit details in writing on available paper. A protest jury meeting may be held to gather and assess information from parties involved, any witnesses, trail cameras and trail reports and if necessary impose penal measures. OFFICIAL TIMES: Times are not official until any and all protests and incident reports are addressed and resolved. Awards should not be presented until after times are declared official.